Danica Patrick and Ricky Stenhouse Jr. survived a rocky first Sprint Cup season. 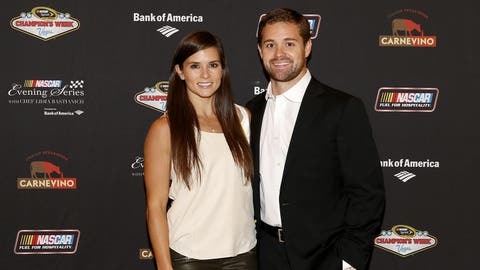 Ricky Stenhouse Jr. may be waiting to see how his NASCAR career develops as Danica Patrick’s boyfriend before popping the question. Although Patrick mentioned in a recent article that she was open to marriage again, when Stenhouse was asked at Homestead whether he had engagement plans for the offseason, he laughed nervously and answered, "No. " However, he was open to getting into the garage pool over whether they’ll set a date. "That’s the first time I got that question," Stenhouse said of the couple’s plans. "I need to get in on this pool so I can afford more stuff." Stenhouse, who looked very uncomfortable as he and Danica were roasted at last week’s NASCAR Sprint Cup Series Awards, insists all the attention on them this season wasn’t a distraction, but told FOX Sports’ Lee Spencer that he wishes the season on the track "would have gone better for the both of us." "She had her struggles, I had mine," Stenhouse said. "Mine were trying not to overdrive the car, which pays off a lot of times in qualifying. And she drives a nice, easy, even pace, and that doesn’t pay off in qualifying. We’re trying to balance that off so we can get her going a little bit better in qualifying. "But it wasn’t a distraction. At least we both had to be at the rookie meetings at the same time. We graduated from our last rookie meetings. That was a relief because an hour before every first practice you have to be on point and don’t be late. It was good to get the last one out of the way." Not a distraction, huh? Even when she’s dressing like a showgirl and co-hosting the American Country Awards?